Daily wear and paint imperfections like; swirl marks, water spots, light scratches and even bird etching marks can leave your paint looking tired and dull. Paint Correction can usually remove all of these without the high cost and inconvenience of a respray. Based on our many years of experience we will be more then happy to provide you with an informative and accurate time and cost for correcting your paintwork. Proper preparation is also the key to good results, your car will be snow foamed to dissolve all the dirt and grime, de-waxed to remove any old polishes or waxes that maybe hiding more defects, decontaminated to remove road tar, tram dust, tree and more – and then taped up with 3M automotive tape to protect the trim, rubbers and other areas that are sensitive. This preparation takes time but ensures the very best results – many other ‘car detailers’ simply skip this step and it shows in the end result. We also use specialist lighting to be able to see all of the paint imperfections, and ensure we focus on every area of your car, this lighting imitates sunlight which as any enthusiast knows shows off paintwork to its very best or very worst! After permanently renewing your paint, we will then detail the rest of the exterior of your car, and protect your paint with a paint sealant or coating and offer you a choice between the two. This will seal in that deep, clear gloss ensuring it remains longer and makes it easier for you to wash and keep your car immaculate. Once completed professionally, good paint correction can last for many years, it is not something that needs to be repeated frequently – proper washing, protection and maintenance are the key to keeping your paint in excellent condition. 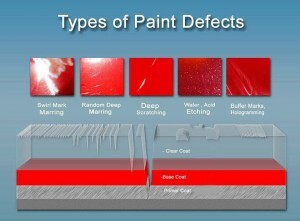 How do we examine your paint to evaluate the condition? Firstly we use a ‘Paint Thickness Gauge’ that tells us the overall thickness of your paint in microns, these professional gauges are worth hundreds or thousands of dollars and can provide valuable information to the history of the paint. We also include our years of detailing experience to investigate the paint using xenon light, to also find if the car has been resprayed or repaired, as these are also important factors. How long does Paint Correction take? It depends entirely on the current condition of your paint. Some minor paint corrections can take 2 days, while some serious corrections for badly weathered and worn paint can take 6-7 days – yes that is up to 50 hours of polishing, refinement and finishing for one car. 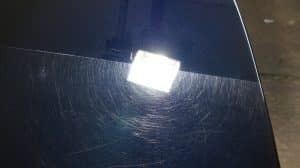 How much does Paint Correction cost? Does Paint Correction remove a lot of paint and endanger my car? If done by a real professional that knows about paint types, hardness, depth and uses the best car care products and modern techniques – No. The majority of imperfections are within the first 5-10 microns of paint/clear coat, a modern car should come with 100-140 microns of paint. If the correct techniques are used then the removal of paint is minimal and consistent, a lot of cars have more paint ‘hacked off and unevenly’ by some unqualified detailers and car washes that offer a cheap ‘cut and buff’. When you polish a car with a machine, will it leave holograms and swirl marks? Incorrect. When car paint is polished badly using poor technique, cheap products, dirty pads or insufficient preparation then yes, holograms / buffer trails or swirl marks are left in the paint and these can be seen in the sunlight. We prepare the paint surface properly, use only the best products and 30+ years of combined experience – we guarantee results. Why don’t you offer Stage 1 or 2 details? Some detailers offer stage 1, 2 or 3 details / corrections / enhancements. We do not believe in this kind of ‘detail’ – let alone for a ‘paint correction’. The reality is that the paint on your car is in varying conditions on different areas/panels. For example; the paint on your bonnet or boot is probably in worse condition due to harsher circumstances than the paint on your doors, perhaps. Therefore it will take more time, more ‘stages’ with the polisher and a range of polishes and pads – so while 1 stage might give good results for some areas, it will not for all. We analysis and treat every area of your car with focused techniques to deliver real results and bring all panels up to the same standard, some panels need 1 or 2 stages while others may need 4 or 5 to achieve the same finish. Many companies and individuals will say that they can polish a car but sadly, the results are often very poor – paint levels can be left dangerously low, there may be visible marks left from the buffing itself, the original marks may still be present but just temporarily filled, etc. When it comes to paint correction/polishing, you really need a specialist. At Melbourne Mobile Detailing we have years of experience in paint correction to concours standards and beyond. We ALWAYS work within the safe limits of your car’s finish – we aim to give you results that last!